Michael Cobley is the author of the Humanity's Fire sequence among others. 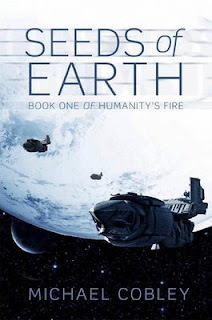 The first of those, which I particularly enjoyed because of the diverse cultures and accents used, was Seeds of Earth. Q. What kind of planet would you grow if you had the right seeds? A. If we were talking about a planetary biosphere, I would definitely try to grow one with a species of plant with a complex crystaline network within its trunk, branches and leaves, which converts sunlight into electricity, perhaps linked to large underground organic batteries/heating web - perhaps this plant came about as a result of evolutionary symbiosis with some burrowing creature/insect which benefits from warm ground and which somehow protects the sparky lightning plant. Anyway, some subtle genetic engineering could result in a cheap, easily grown, easily maintained form of organic power generator which would make life in sunny climates rather different from how they are on our world. If we're talking about the socio-political world, well, we really need an international social democratic movement ready to curtail the power of international finance, and we need a United Nations that is able to defend weak nations and promote democracy, and which provides worldwide forums for debate, and which provides means whereby joint action can be taken against climate change and other international crises. I know, dream on, eh?